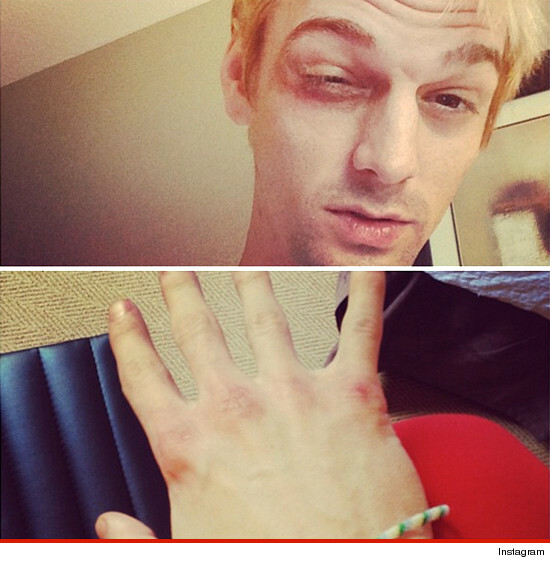 Aaron Carter is sporting a shiner he claims he got from 4 grown men who were pissed he's performing on "New Kids on the Block" turf ... aka Boston. Aaron, who posted some gnarly selfies after the fight, tells TMZ he was leaving dinner with a friend last night in beantown, when a huge guy approached him in the parking lot and yelled: "I heard you’re doing a show here tomorrow. This is the town of the New Kids." Aaron claims three other guys then jumped out of a gold Chevy Malibu ... and started the beat down, which came complete with a shot to his face. The singer claims he landed a few punches before the NKOTB-lovers took off -- "I think my knuckles might be broken, but that's what they get. People think I'm a pretty little white boy but no way. I think I won. I'm still standing." Aaron says he's performing as scheduled tonight, and he's not filing a police report because it's "girlie." Two shocking things: Who knew NKOTB fans were so hard? And ... Aaron Carter still sings?